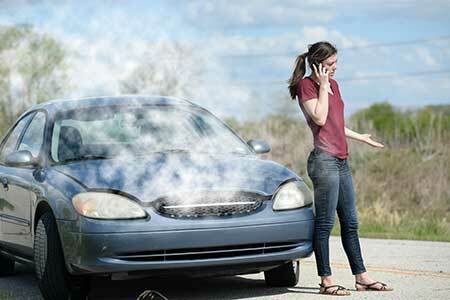 A thorough check of the air conditioning system will be necessary as summer approaches. Now, if you’re already used to cold Michigan winters, then the system was cycled on and off during the winter in order to keep the pumps and seals lubricated. In any case, as summer approaches, turn the system on and make sure that cold air is present in the selected modes and at the appropriate vents. If the air is cool but not cold, if the temperature fluctuates dramatically with engine RPM, or if the air does not blow at the appropriately selected vents, then it’s time for a check-up with your mechanic. After all, is it better to nip the problem in the bud now or wait ‘til it gets really hot before you head to the garage? It’s always best to get things into top condition before the worst of the heat strikes. Checking the cooling and lubricating fluids in your car’s engine is one of your most important steps. Coolants should be clean and filled to the correct level. Make sure that yours is mixed at a 50:50 ratio with distilled water unless you’ve already purchased pre-mixed coolant, and you should also be changing coolant completely every 2 years. Oil, on the other hand, should be summer-grade and changed regularly. Oil is generally fine in warmer temperatures, but using the wrong viscosity can hurt your engine if the temperatures get high enough. The light oil you used during winter will become too thin to work at high temperatures—increasing wear and tear on your engine components. This is a basic step but can’t be reiterated enough—your tires need to be checked for proper inflation on a regular basis. Overinflated tires are at risk of blowing out, while underinflated tires get worn out more quickly. Hot weather makes both conditions worse, and even just the temperature change from winter to summer can cause thermal expansion and an improperly-inflated tire. Aside from that, changing to a seasonal tire can give you better performance—summer tires will stand up to hot asphalt better than the soft tires we use in the winter. People are wary of batteries dying in the winter—we’ve all heard the stories of people getting stranded in their cars in the middle of a blizzard because their batteries died. That’s a reasonable fear to have, but people should really be more vigilant about battery issues during summer. Before you head out on your next road trip, check what date is stamped on your car battery. If it’s over three years old, it might be time to consider a new unit. Even if the old one is working fine right now, it’s better to have the peace of mind of a new battery—instead of worrying about getting stuck by the side of the road in 100-degree weather with no gas stations for miles around. Keep this checklist in mind before setting out on your next road trip or beach adventure. If you need a trained eye to take a look at your car and make sure it’s summer ready, it’s best to consult with a professional. Let King Brothers Collision help keep you and your family safe—and cool—in your car this summer. Give us a call at 313-534-8090 (Redford) or 734-744-8557 (Livonia). You can also get in touch with us through our online contact form and we’ll get back to you at a more convenient time.